This past summer I frolicked in the sun and under the stars and had the best of times at Golden West Music Fest, a three-day outdoor music and arts festival on the prettiest piece of land near Ardmore, Alberta. The Backhomes, Wet Secrets, Black Thunder and Physical Copies all melted my ears and slapped a smile on my face, and I can't wait for next year. I had such a great time, I've now joined forces with the Golden West planning team to help recreate the magic in 2015. 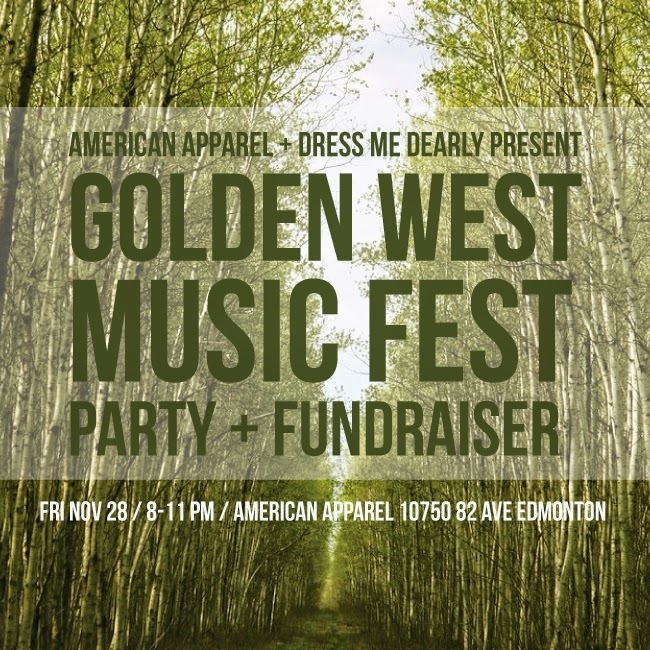 This Friday, join us at American Apparel on Whyte for a fundraiser party to help us bring you the best fest yet! Enjoy a beer courtesy of Steam Whistle Brewery, shop the store at 20% off, and shake your hips to the groovy tunes of DJ's Prairie Dawn and Mitchmatic. We'll also be selling early bird GWMF tickets for only $50 and limited edition GW T-shirts! I wish I could be there on Friday and will definitely watch for Golden West Music Fest in 2015!! Bravo for being involved in something that slapped a smile on your face! Good for you.